Dec. 30 (Bloomberg) -- Former Bangladesh Prime Minister Sheikh Hasina Wajed’s political alliance was swept back to power in national elections, ending two years of military-backed emergency rule. 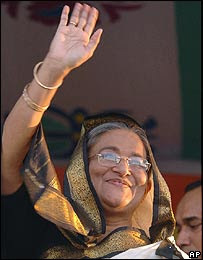 Hasina’s Awami League won a parliamentary majority with results declared in 267 of 300 seats, S.M. Asadujan, the Election Commission’s public relations officer, said by telephone today from the capital, Dhaka, citing preliminary results. Hasina urged supporters to “exercise utmost restraint” and wait until final results are announced later today to avoid clashes with the main rival Bangladesh Nationalist Party, the English-language Daily Star newspaper reported, citing party official Abul Kalam Azad. The new government, which campaigned on a platform of cutting food prices and combating terrorism, faces the challenge of raising living standards in the nation of more than 150 million people, where almost 40 percent of the population lives on less than $1 a day. About a third of Bangladesh, the world’s seventh most populous nation, floods during the annual monsoon, hampering development. A “smooth” transition between governments is needed for Bangladesh’s $72 billion economy to grow at the forecast rate of 6.5 percent in the year to June 2009, according to the Asian Development Bank. A return to a civilian elected government is also essential to stop increasing Islamic radicalization in the Muslim-majority nation, according to the International Crisis Group. India earlier this month asked the army-backed interim government to stop militants using Bangladeshi territory to stage attacks across the border. With ballot papers still being counted, the Awami League- led alliance had 258 seats, compared with 32 for an alliance of four parties headed by the BNP, the Star said. Turnout among the 81 million registered voters was 70 percent, the newspaper reported on its Web site.